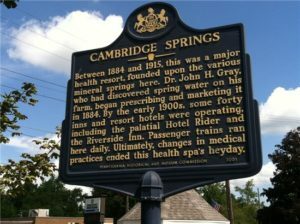 First settled in 1822 as Cambridge (named for Cambridge, Massachusetts), the town was renamed Cambridge Springs in 1897 after becoming known for its mineral springs. By the early 1900s, more than 40 inns and resorts were in operation as tourists flocked to benefit from the reported healing properties of the local spring water. Visitors to present day Cambridge Springs will find a number of small shops and restaurants, as well as the Riverside Inn & Dinner Theater, the only lodging from the town’s heyday as a spa destination. In addition to local eateries and historical attractions, paddlers may want to check with the borough office about camping in Firemen’s Park, directly adjacent to the French Creek Valley Conservancy’s access area. Just a few miles from town on Plank Road is the renowned Campbell Pottery Store. Bill Campbell’s flambeaux art pottery is made here and sold throughout the U.S. The store fills a century-old barn full of three levels of Campbell pottery. The works of other artisans are carried as well. Campbell Pottery has been named one of the Top 25 Retailers of American Craft by Niche magazine. The town was once regarded the midway point by rail between New York and Chicago. A marker stating this fact would have been visible by observant rail passengers and remains near the tracks to this day. From 1912 to 1987, Cambridge Springs was home to Alliance College, a small liberal arts college that was founded “to provide opportunities for Americans of Polish descent to learn about the mother country, its culture, history, and language.” President Taft traveled to Cambridge Springs for the 1912 dedication. The college was known for its folk dance ensemble. Student enrollment peaked at 629 in 1968. The town name was changed to Cambridge Springs over a hundred years ago, but locals often use “Cambridge” in conversation. The French Creek Valley Conservancy recently partnered with the Cambridge Springs Borough to acquire a canoe/kayak launch on French Creek located in Firemen’s Park in downtown Cambridge Springs. The ramp is paved and has direct parking access. Firemen’s park has flush toilets, picnic tables, pavilions, and also has showers that can be opened by calling the Cambridge Springs Borough. Overnight camping in the park is permitted by reservation only. The Pennsylvania Fish and Boat Commission also owns a launch just north of Cambridge Springs on Miller Station Road. Miller Station Road can be accessed by traveling north on Route 6/19 and turning right onto Miller Station Road. A current boat registration sticker or PFBC launch permit are required to use this launch.